The news about the Encampment River bridge is not good. 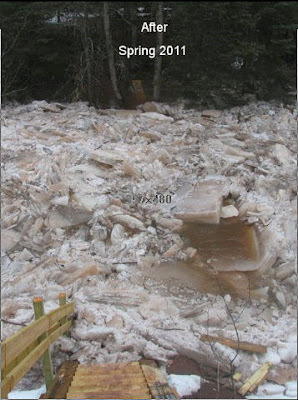 When the huge ice jam hit the bridge it tipped the middle crib over. As the bridge broke apart in the middle (as it is designed to do) the ice snapped the cable for both pieces and they went down the river. One half was several hundred feet downstream and Han was going in there today to try to secure it. The other half is gone completely, maybe all the way down to Lake Superior. With the river still high and road restrictions on, we don't know when we will be able to replace the bridge. The ice buildup was from a freaky situation where we got a hard rain on Dec. 31st which brought the water up really high. Then a new layer of ice formed about 3 or 4 feet above the old layer. So instead of about 1 foot of ice they ice was 3-4 feet thick. It was this thick ice that took the bridge out, even though the bridge was raised a couple of feet when we rebuilt the cribs and ramps last October. From Co Rd 301 (Fors Rd) take the SHT 0.4 miles until it crosses Co Rd 3 (Hwy 3). Turn left (north) and go 4.7 miles to West Castle Danger Road (this road does not have a green sign but there is a bright blue sign that says "To Hwy 61" with a right arrow). Turn right (east) and go 1.6 miles to where SHT crosses road. Go left on SHT 0.1 miles to Castle Danger Trailhead parking lot.